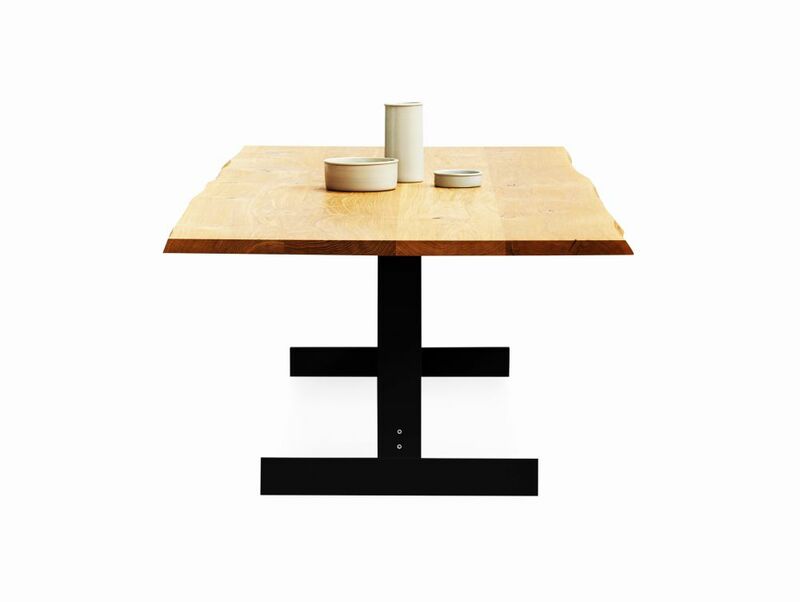 Inspired by Suprematist compositions, table KAZIMIR by Philipp Mainzer features a bold mix of geometric forms and materials. Focussing on a distinct construction, the tabletop made from solid European oak or walnut rests on a metal centre base, allowing for various interpretations in private and public spaces. Available in a range of standard and custom colours as well as exclusive materials such as galvanised zinc, blackened steel and brushed brass, the frame features a characteristic refectory table construction, which provides stability for tables up to 3600 MM (141 3/4 INCH) and generous seating at the table ends. KAZIMIR RAW features solid wood boards with a width of up to 250 MM (9 7/8 INCH) exposing the brushed natural edges of the tree.